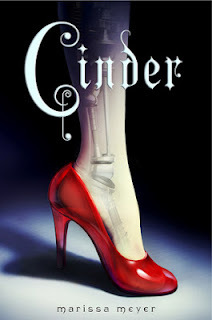 CINDER is my new favorite Cinderella retelling (sorry Ella Enchanted!). It felt fresh. With all this dark, creepy dystopia on the market today, here's a lighter dystopian book with just as much adventure, romance, and all-around awesomeness! It really didn't feel dystopian at all. There were still the big problems of war and incurable disease, but the characters still had hope, which made the biggest difference. I LOVED all the characters! The good guys were good, the bad guys were bad, and the stepmother remained in the middle of the two. I don't want to say that they felt unrealistic, but they weren't completely realistic either. Except for Cinder, all the characters felt like they were slight caricatures of their true selves. This wasn't a bad thing, though. It just made it kind of easier to point out "Oh, he's prince charming! And that's the evil person! Oh, and don't forget the fairy god-droid!" I know everyone's been talking about that really predictable plot twist. Yeah--it was predictable. And knowing beforehand that there was a predictable twist like that meant that the first time it was even mentioned I totally figured it out. Luckily, that didn't take away from the story at all! The plot never lost excitement, and kept me on my toes throughout it all! I would recommend this book to ANYONE in a heartbeat! It's a fairy tale for the girly girls, with a strong willed cyborg heroine for the not-so-girly girls, and it's got robots and mind-controlling moon people for all the boys! I have this on hold at the library, so I'm happy to hear that others are enjoying it.